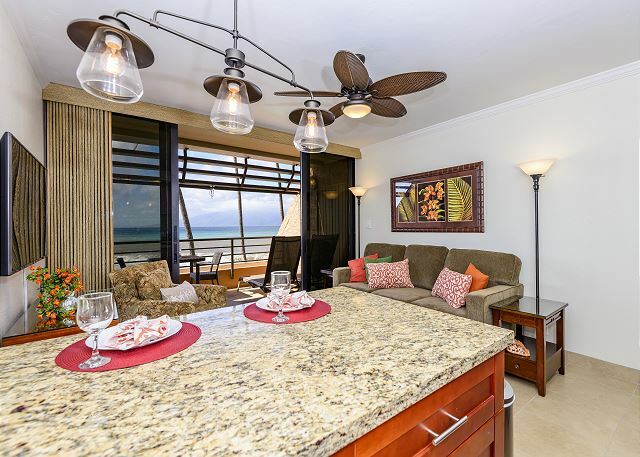 The ultimate in luxury awaits at our completely remodeled and refurnished 1 bedroom, 1 bathroom oceanfront condo. Just steps from the water, this truly exceptional suite offers spectacular unobstructed ocean and sunset views from the lanai and living room --- the perfect spot for whale watching and taking in the tropical blue hues of the Pacific Ocean. Unit 614 has the BEST OCEAN VIEW at the Kuleana Resort. This one of a kind condo features ALL NEW gorgeous stainless steel appliances, beautiful wood cabinets, granite counter tops, tile floors, and all new furniture! The fully appointed kitchen is impeccably clean and fully stocked with cookware, dishes, and stemware for all of your cooking and entertaining needs. The bathroom features all new tile throughout as well as a new wood vanity, sink, new clear glass shower partition and new mirrored closet doors (in both the bathroom and bedroom)! The master bedroom is AIR-CONDITIONED and has a comfortable king size bed. The unit is decorated with high-end art and decorations. There are 2 HD smart TVs for streaming. You can access Netflix, Amazon, etc. with your subscription (49" TV in living room, 32" TV in bedroom). The private lanai has new sliding glass doors and bamboo drapes for sun protection in the afternoon. The condo is perfect for a couple celebrating their honeymoon, anniversary and life! Professional cleaning company. 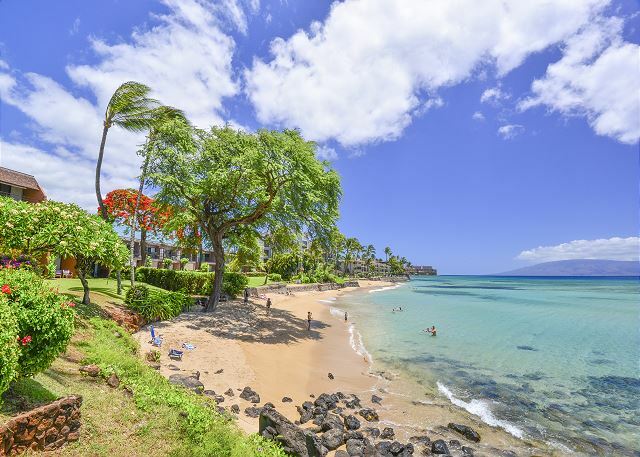 This beach front condo is located on West Maui. It is beautifully landscaped and maintained in a peaceful and quiet setting. There are 2 sandy beaches on either side of the condo for easy access water. From here, you can snorkel, paddleboard, surf, kayak or swim. 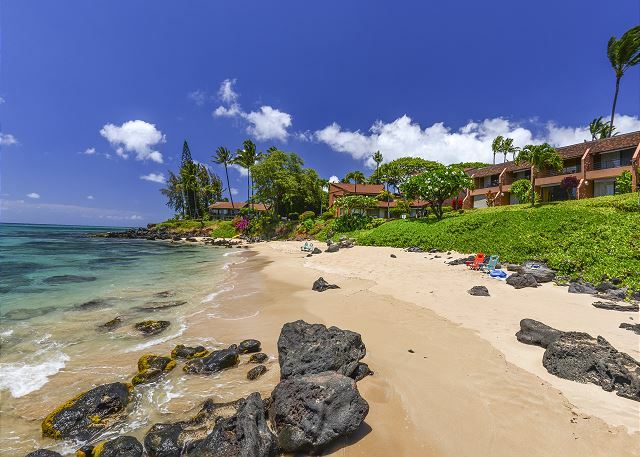 Directly in front of the condo is a lawn area and beautiful rocky lava reef with a ladder to enter the water to snorkel and be amazed by the various types of sea life. Tropical gardens surround the large heated pool, tennis court, shuffle board area, putting green, and outdoor barbecue grills. This condo is a 2nd floor unit in a 3-story building and is only steps from the water with unobstructed views. Sit on the lanai in the reclining lounge chairs and watch the turtles, dolphins and whales while relaxing and enjoying the ocean breezes. 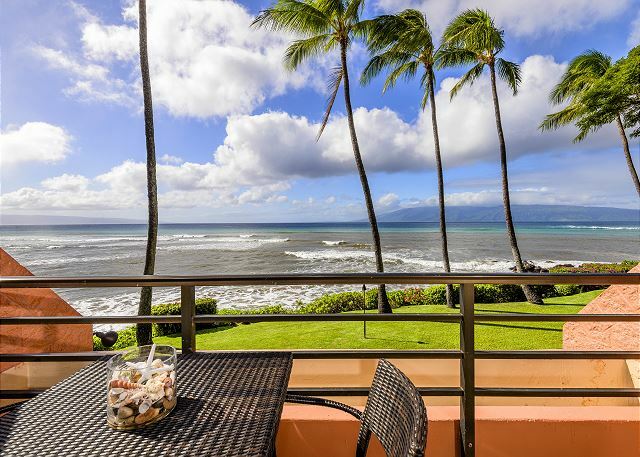 There are unsurpassed views of Lanai and Molokai while dining on the private lanai. This is the perfect place to relax and unwind, unlike larger hectic resorts. Guest Reviews of top-rated beachfront unit! best views! steps from water! 5/5 stars Review by Annette B. When we walked in the front door, we knew we had the right place! 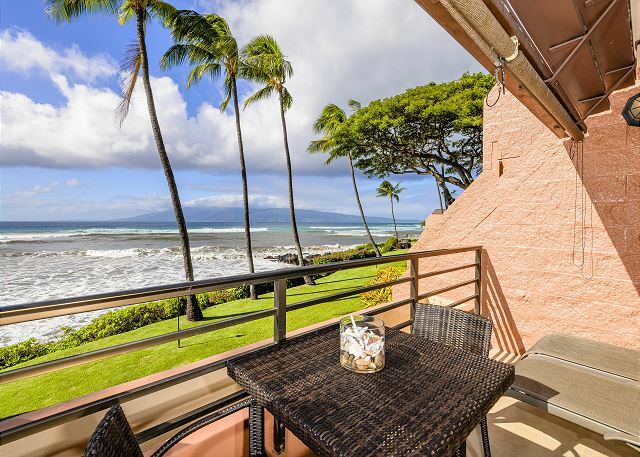 The ocean is a stone's throw from the nicely appointed lanai. You can see several islands as well as sea turtles, whales and more! The unit has been newly remodeled and beautifully done. The bed is comfy. A/C in the bedroom which helped a lot. There is also a pull down shade on the lanai which helped during the late afternoons.We were able to snorkle at the beach right there with sea turtles everywhere!! It was an amazing experience.The resort itself is just beautiful. We felt like we were in our own little world as it was quiet and peaceful and just what we were looking for. 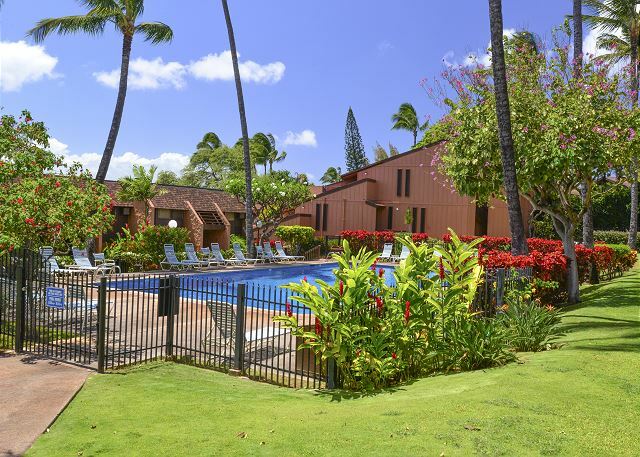 It is also centrally located so we were able to go into Lahaina multiple times with ease as well as walk to the Farmer's Market and other restaurants about a mile down the road. The only issue we had was trying to find the initial key box. Directions were a bit hazy. But the on site manager was incredibly helpful and on more than one occasion.There is no washer and dryer in unit and we had a really difficult time figuring out where the laundry room was, but finally figured it out. We will definitely rent this unit again!! Perfect in all respects. Booked for next year! My husband and got away for our 35th wedding anniversary at the Kuleana condos. The location was great, not far from local town for a nice walk in the morning. Ocean was right out our back door, so seeing how my husband is a surfer, this was a perfect spot. He was basically the only one out for hours and if you are a surfer, you know that’s nearly impossible to have the surf to yourself. The weather didn’t completely cooperate but we filled in our time with great drives and going to great restaurants.You won’t be disappointed with this sweet little slice of paradise. 5/5 stars Review by Daniel S.
This is a beautiful unit in a wonderful location. Fantastic beach just steps away with water access for snorkeling as well. The unit was nicely updated and very clean. A perfect place to spend a week in Maui. 5/5 stars Review by Ab- Isabel C.
I wanted one thing for my beach vacation: to stay in a condo that was right on the beach, where i could wake up, look at the waves, and go to the beach. and we did! the place was perfect for us; a 10 minute walk from stores and restaurants, very comfy bed. Will definitely recommend and return. The place was excellent with a beautiful beachfront view. Looked like it has been remodeled and was in excellent condition. Had all the things needed to go and enjoy the beach. Couldn’t ask for a better place to stay. Will definitely stay here again. 5/5 stars Review by Roy H.
Our stay was great. Very nice, low key condo complex with very well maintained grounds. Quiet beach and snorkeling area within steps of the condo. Beautiful view from the lanai...lots of sea turtles. Condo was very clean and nicely appointed...comfortable king size bed..A/C in the bedroom was a plus. Would definitely stay here again. 5/5 stars Review by Catherine S.
5/5 stars Review by Devon H.
The view is unbelievable. The second you walk in the door, you can see the ocean. The apartment is beautiful. The grounds are very well kept. It was peaceful and quiet. The beach is about 100 feet from the door. At least another dozen beaches are within a 10 min drive. I will definitely stay here again and recommend anyone to stay here too!! 4/5 stars Review by Joyce V.
Everything went smoothly, nice condo complex, grounds are well maintained. The view from the lanai is perfect, saw many sea turtles. Condo was small, but well decorated. Only complaint I have is that the tile floors were dirty. Tried to leave shoes at front door as requested, but the bottoms of my feet got black from dirt on the floors. Everything else was clean. 5/5 stars Review by Barbara M.
Was a beautiful place to spend time with the ocean up close and inviting. The rental had everything needed to make our vacation perfect. Hope to be back soon. Great condo and amazing location! 5/5 stars Review by Drew S.
Condo was perfect! Just what we needed. Nicely remodeled. Amazing location in Napili as close to the ocean as you can get. We opted to use the pull out sofa bed which was surprisingly comfortable and was right next to the floor to ceiling sliding glass doors which we left open at night to fall asleep to the crashing waves. Close to a farmer's market and coffee shop and away from the heavily trafficked tourist areas. Would stay here again! Recommend for couples who are looking to relax and enjoy Maui. Modern facilities and great views of the ocean! 5/5 stars Review by Mary Jane W.
The condo was clean, beautifully updated, and fantastic ocean view close to waters edge, Hearing the ocean waves and watching whales spout and turtles swim from our lanai was wonderful. 5/5 stars Review by Dianne B. Each morning we would wake to the waves crashing, turtles swimming just below our room and the whales splashing in the distance. A perfect place to sit with a morning coffee and watch the world go by. We would definitely rent this unit again. We have been home for one day and I want to go back.